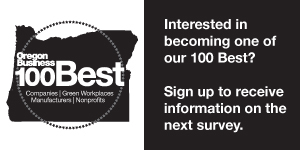 Oregon Business - "People want to feel they are creating meaningful work"
When it comes to sustainable business practices, FMYI may be in a class by itself. Besides its collaborative social networking software for business, the company is known for making decisions that minimize its environmental footprint and maximize societal impact. Telecommuting? Yes. Bicycle commuting? Of course. Car-sharing discounts; public transportation; reduce, reuse and recycle? Five times yes. FMYI chief executive and founder Justin Yuen credits, in part, his previous work life at Nike as a product and sustainability manager for helping to shape his current management approach. But he also cites another influence, praising the performance of a New York City billionaire executive who thrived in government. Not that one. Yuen is thinking of Michael Bloomberg, the founder of the Bloomberg empire who served as New York’s mayor from 2002 to 2013. Yuen rattles off Bloomberg’s well-publicized successes: creating a more bicycle-friendly and walkable city; targeting the health scourge of sugary soda drinks; and seeking to control the proliferation of guns. In full disclosure, Yuen is partial to Bloomberg in part because they share roots with the Johns Hopkins University in Baltimore. Yuen was editor of the school newspaper and met the billionaire when Bloomberg served on the university’s board of trustees. Regardless of bias, Yuen says Bloomberg showed “a chief executive can contribute expertise in certain functions” and could adapt to the more deliberate pace of government. Cultivating a company that stands for more than profit is essential, said Yuen. He is board chair of the Street Trust, formerly known as the Bicycle Transportation Alliance; serves on the Multnomah County Advisory Committee on Sustainability and Innovation and is a member of the Metro Portland Community Investment Initiative Leadership Council.